So it has been forever and 3 days since I attended a YELP event! 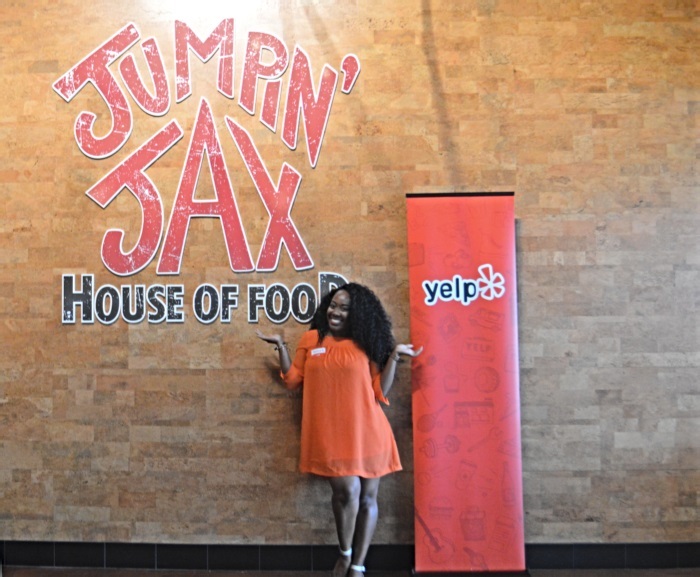 I miss being Yelp Elite so I should probably get to posting and interacting a bit more on there, but nevertheless, I got into a YELP CYE recently, at a fairly new fast-casual restaurant in town called Jumpin’ Jax House of Food! It was the perfect food outing for a rainy Sunday afternoon! This place reminded me of a modern day hang out spot for teenagers like you use to see in shows like “Saved By The Bell” back in the day. I say that because of the fast-casual seating as well as the wide range of teen-approved menu items that we ALL still enjoy and love if I’m being real. Jumpin Jax’ opened a little under a year ago and the owner, Howdy, started out at Maple Street Biscuit Company. 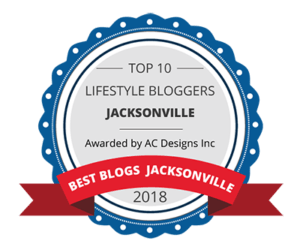 When I learned that, I knew we’d be in for a treat that day, as I love me some Maple Street! 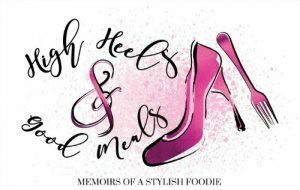 As with all Yelp events the food was flowing and the laughs were rolling! We were able to sample a ton of treats from the menu after enjoying sweet potato fries and buffalo cauliflower bites which were so bomb! They were the perfect marriage of tangy and spicy! Who would’ve ever though cauliflower could taste so good. After apps, the courses came flooding out of the kitchen. In no particular order here’s what else we enjoyed! This was the Caribbean Chicken Sandwich. Tasty, of course, with a sweet surprise in it! 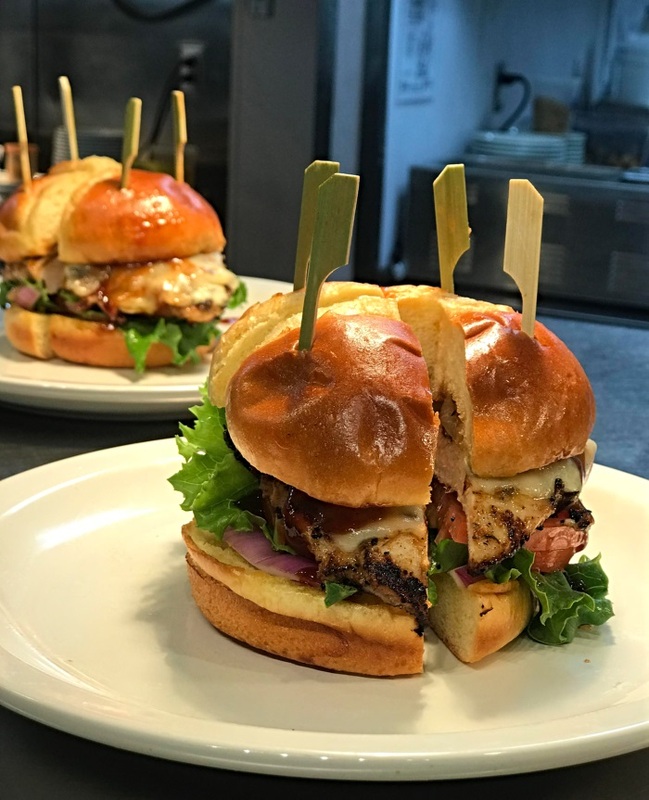 It consisted of grilled chicken, melted Pepper Jack cheese, came dressed with the lettuce, tomatoes, red onions, JAX BBQ sauce, and the sweet pineapple! Definitely a tropical tasting sandwich. Next up we sampled the “Air Thang” burger. I honestly feel like this burger doesn’t live up to it’s name. Don’t get me wrong, it was delicious but for a name that, to me, means it will give you your entire life, I was left feeling a little disappointed. 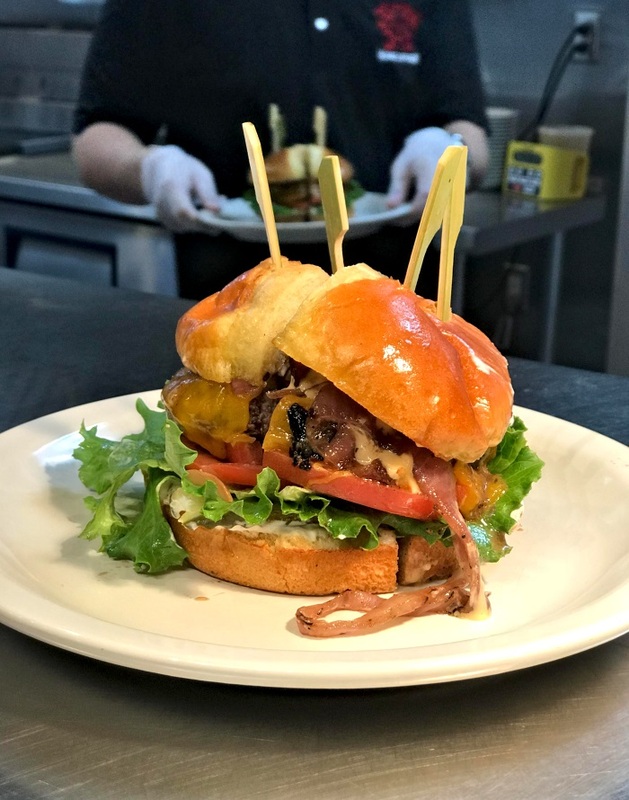 It came with a medium cooked patty, lettuce, cheese, bacon, pickles, onions, tomatoes, mushrooms, and JAX secret sauce, all on a toasty, buttery bun. That’s all well and good, but if it’s Errrrrthang, I’m going to need a little bit more. Maybe a fried onion ring and unicorn tears will suffice. End rant. 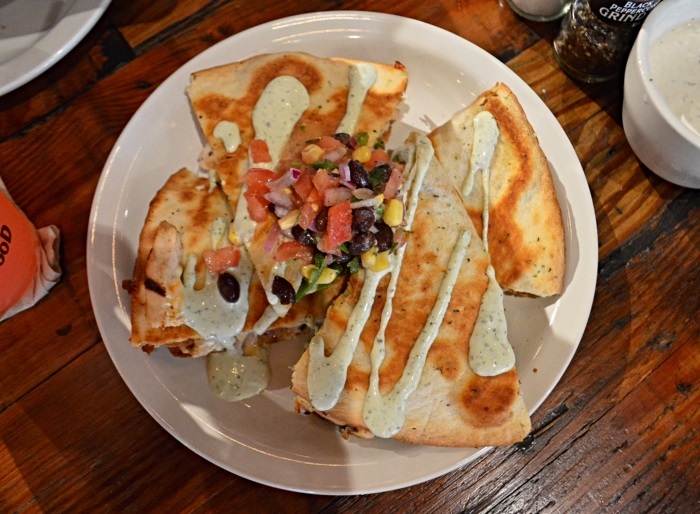 The Tex-Mex chicken and cheese quesadillas were my favorite for the evening. They were perfectly cheesy with a hint of spicy! They had all the components of a great quesadilla and they didn’t skimp on the stuffing. 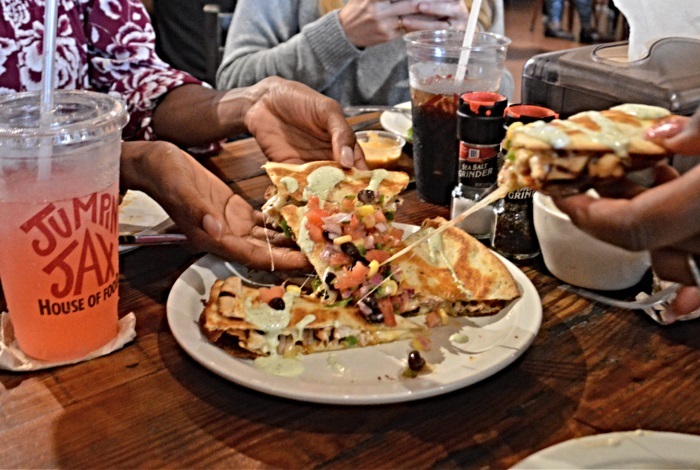 Who can stand a wimpy quesadilla?!?! Not I! Thank you JJ (my new name for Jumpin Jax’) for giving me ALL THE STUFF! You already know they had pizza on deck! 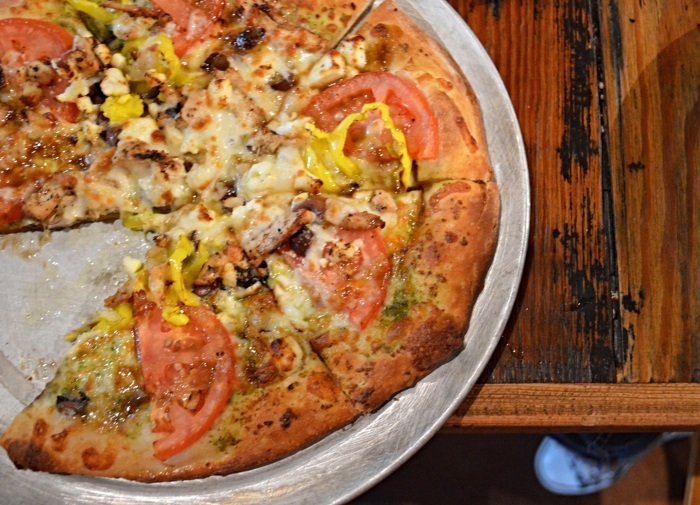 We had a regular Cheese Pizza, which was tasty, and the Mediterranean Chicken Pizza which had grilled chicken and a delicious pesto sauce, tomatoes, and peppers. We learned about the special ingredient in their dough that makes their pizza stand out and I challenge you to find out what it is! You’ll probably be pleasantly surprised to find out what it is! 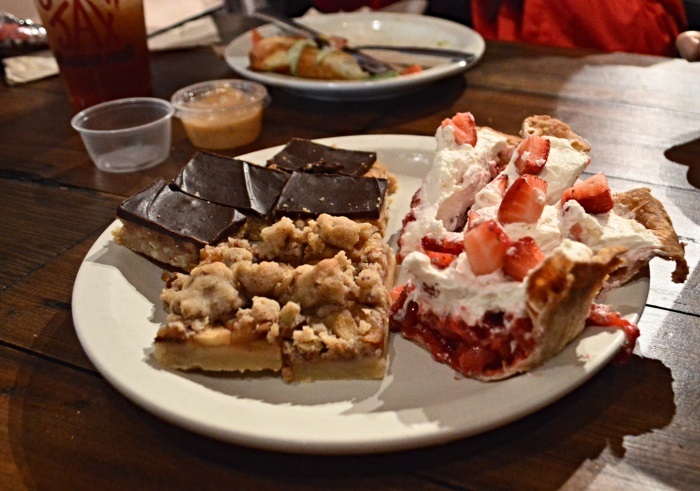 Lastly, we had to make room for dessert which was provided by Debs Dream Pies from a local bakery in the Mandarin area. Y’all I was full but I took a nibble of each of the three pie bars. I didn’t care much for the Strawberry Dream Pie and Chocolate Pretzel Peanut Bars but the Apple Pie Crunch Bar was tasty. My underwhelm-ment may have very well been due to the fact that I was entering into a food coma but the apple pie situation…I could have that again for sure! Overall I had a pretty good time. 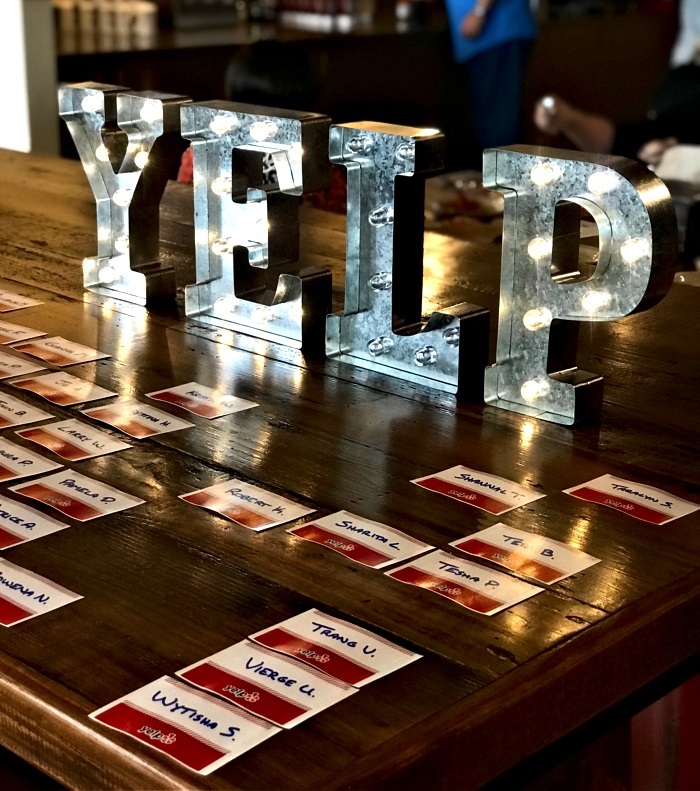 It was nice being back around my Yelp buddies and our local community manager, Matt, always throws great YELP events. 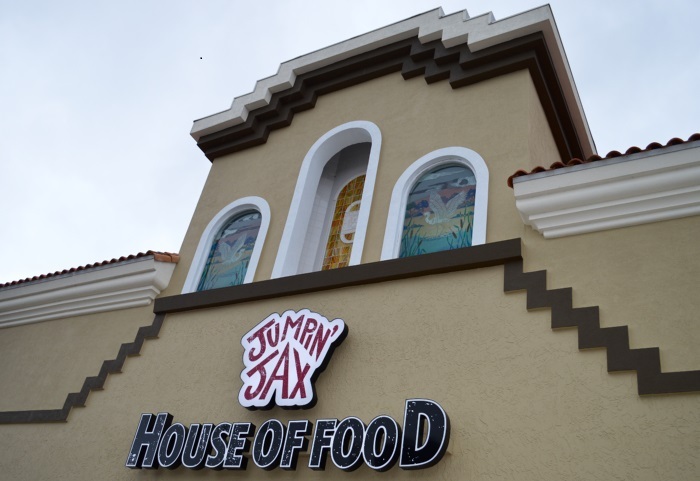 As for Jumpin’ Jax, this is the perfect place to go when you’ve got the yearning for some good ole’ All-American/ Tex-Mex eats. 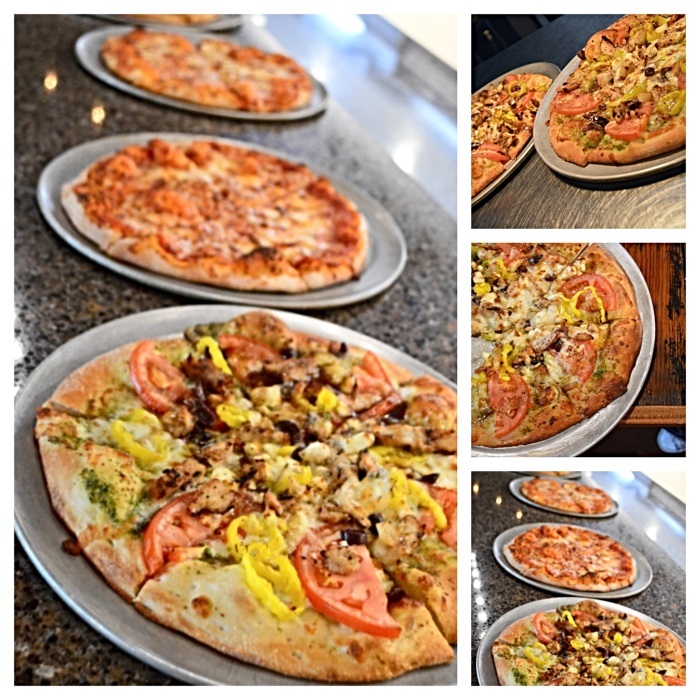 They are the perfect place to fulfill all of your pizza, burger, salad, wraps, and sandwich needs! The kids will be out for summer in the next week or so, take them there, they’ll love it!